A still from a report by Russia Channel on a new exhibition of works by Repin. For the full report, see below. This resource looks at culturally-informative Russian news broadcasts and presents each with rhetorical and contextual analysis as well as a brief vocabulary list aimed at intermediate-level Russian students. 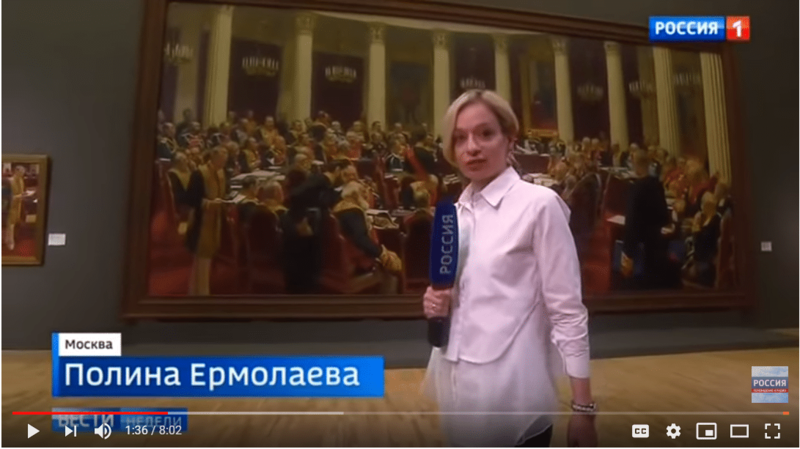 Russia Channel devoted an 8-minute report on its regular Sunday national broadcast to a new exhibition of Ilya Repin at the New Tretyakov Gallery in Moscow. The report emphasizes that the exhibition, in celebration of the 175th anniversary of Repin’s birth, is the largest ever held for the artist: with 300 paintings being shown together. The report emphasizes the history shown in Repin’s work, with the Tretyakov’s general director, the director of Repin’s house museum, and other major figures in Russian culture shown discussing the artist and his work. This includes anti-Soviet sentiments present in his post-revolutionary work and elevation to “national genius” under Stalin. The collection however, gives a deeper, more complex, and richer depiction of Repin than has been shown before. красота в правде: (the) beauty is in (the) truth. Under a new federal program, Vladivostok, Kaliningrad, Kemerovo (in central Siberia), and Sevastopol (in contested Crimea) will have major new museum complexes built. These are to be multifunctional spaces for exhibitions, performances, and education and are expected to be large enough to serve as major regional cultural institutions. First Channel asserts in a very short report that the project will make stereotypes of Russia’s provinces as uncultured places a thing of the past. President Putin initiated the idea last year in his speech to the federal assembly. The institutions are to be operational by 2023, a year before Russia’s next presidential elections. According to the report, Russia’s major theatres will tour these facilities and exhibitions will be sent from Russia’s major museums.